Hair is important to women. It’s an essential component of our self-identity and overall body image, and one of the only aspects of our appearance that we have full control over. So if you find yourself staring at the shower drain and noticing more hair than usual, that’s definitely a cause for concern. It’s often assumed that only men experience hair loss, but surprisingly, less than 45 percent of women will live their life with a full head of hair. Collectively, women make up 40 percent of American alopecia sufferers, which equates to approximately 21 million women in the US alone. There are two main types of non-scarring hair loss in women: female pattern hair loss, also known as androgenetic alopecia, and telogen effluvium. We asked Dr. Rhonda Klein, a respected board certified dermatologist in Milford, CT to help us understand the differences between the two. Female pattern hair loss is the most common hair disorder in women. It is most predominant in women of Caucasian ethnicity, occurring in 3 to 12 percent of women in their 30s and increasing with age — 14 to 28 percent in women in their 60s, 29 to 56 percent in the 70s, and up to 60 percent in women 80 years and over. For women of Asian ethnicity the rate is lower, at approximately 12 to 25 percent in those over 70 years. It significantly less common in women of African ethnicity, though the actual statistical data is not available. The main symptom of the condition is a diffuse reduction in hair density. To say it is unattractive and unappealing to women is an understatement, as it visually presents itself as very thin hair that can make the scalp visible. Hair can also fall in patches. And though the condition can occur anywhere on the scalp, in most cases it affects the top and front regions. Once diagnosed, the hair loss is classified on a scaling system, with each stage representing increasing hair loss on the front and top of the scalp. Male and female hair loss look identical, which is why it’s long been believed that in both cases a predominance of the androgen hormone testosterone, otherwise known as the “male hormones,” is to blame. That’s why female pattern hair loss is also called androgenetic alopecia, the same as male pattern baldness. However, the exact cause of hair loss in women is still unclear. Hormonal changes certainly may trigger changes with hair growth, particularly during pregnancy and menopause, along with menstrual cycle disturbances or taking medications that alter hormones, such as certain birth control pills. During menopause, women do experience a significant change in hormones, particularly a decline in estrogen levels, which may subsequently influence hormones such as testosterone. There also appears to be a connection with the conversion of testosterone to dihydrotestosterone (DHT). DHT aids enzymes in the hair follicles; with changes in hormonal levels, lack of DHT may interrupt the hair growth cycle. According to scalp biopsies, there is an underlying inflammation that seems to lead to the development of female pattern hair loss. This suggests that the immune system is somehow involved. So while the exact cause of female pattern hair loss is still poorly understood, you can rest assured that blow dryers, flat irons, a comb, or tight braids do not cause hair loss, though you may notice hair fall out while engaging in these activities. What is known, however, is that the growth phase of hair follicles gets shorter with each hair growth cycle. In female pattern hair loss, the two cycles affected are the anagen stage, which decreases; and the telogen stage, which can remain the same or lengthen. Overall this affects the anagen to telogen balance. And since it’s the growth stage cycle that is majorly affected, the result is that new hair lacks the ability to reach beyond the scalp surface, appearing as hair loss. As for other factors, studies indicate that women lacking in vitamin D may be at increased risk. There is also an association between other medical conditions such as ovarian cysts, polycystic ovarian syndrome (PCOS), obesity, insulin resistance, hypertension, hypothyroidism, hyperprolactinemia, autoimmune disease, and raised aldosterone levels. While all these factors may increase your risk of hair loss, one causal factor is much clearer — if you have a family history of females with hair loss, there’s a much greater chance you will develop the condition as well. Unfortunately, there is a strong genetic disposition that does get passed down the line. There are two types of telogen effluvium — acute and chronic. More sudden hair loss is called acute telogen effluvium. 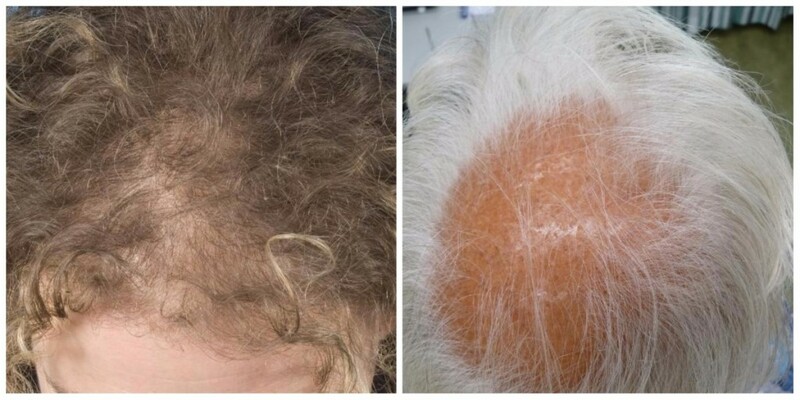 Acute telogen effluvium may be temporary, or eventually become chronic telogen effluvium. Chronic telogen effluvium is when excessive hair loss continues for at least 6 months without any noticeable widening of hair loss in the scalp region. In some cases, chronic telogen effluvium can also eventuate into female pattern hair loss. Telogen effluvium frequently occurs following childbirth, illness, crash dieting, physical stress such as major surgery, emotional stress, or from taking certain medications. It can also be a secondary condition of thyroid disease and systemic lupus, two autoimmune conditions. You won’t notice telogen effluvium appear for approximately 6 weeks to 3 months following a stressful event or the use of medication. But if you begin to notice unusual hair shedding or hair thinning, consult with a dermatologist immediately. The sooner telogen effluvium is treated, the less likely it will become a chronic problem. Low level laser therapies are attracting some interest, though at this stage, there are no clinical trials to prove their effectiveness. For more severe hair loss, cosmetic aids such as camouflage and wigs are the cheapest and easiest option. And as Dr. Klein suggests, another alternative is hair transplantation. Generally, a hair transplant procedure involves removing hair from a donor site, often the sides or back of the head, and relocating them to the thinning areas. There are a variety of hair transplant procedures available, some more effective than others, so be sure to do your research. “There are also many new and exciting treatments on the horizon as well, such as topical latisse foam,” says Dr. Klein. But one word of caution: unless you do your research or consult with a dermatologist, keep your pennies in your purse because there are many bogus treatments on the market with no proven efficacy. These include amino acids, aminobenzoic acid, ascorbic acid (vitamin c), benzoic acid, B vitamins, jojoba oil, lanolin, polysorbates 20 and 660, sulfanilamide, tetracaine hydrochloride, urea, wheat germ oil, frequent shampooing, electrical stimulation, scalp massage, and Chinese herbal extracts. If you do have substantial hair loss, another important factor to keep in mind is sun damage and skin cancer. Since the scalp is exposed to sunlight this can be an additional concern that requires monitoring. And while hair loss and balding is more accepted in men, for women it is known to cause more distress. Women with hair loss frequently experience a wide range of psychological and emotional disturbances including anxiety, shame, self-consciousness, stress, depression, and even social withdrawal. Most importantly, don’t try to deal with the condition on your own. If you find yourself alarmed by sudden or unusual hair loss, the best person to consult is a dermatologist who will provide an accurate diagnosis and work with you to find the best possible treatment.